I'm reading through the the ICANN factsheet (08mar07.pdf) and this paragraph jumps out at me. A third category is the huge increase in individual Internet users installing routers in their homes, usually to provide wireless access or to link up several computers in the house. These consumer products usually come with the same password and a large percentage of home users never change this default password, making it easy for hackers to seize control of them for their own ends. If consumers were encouraged to change the default password or if router manufacturers were persuaded to provide each unit with a different password, then future attacks against the Net’s infrastructure could be tackled at (the) source. I know there has already been quite a bit said about this topic here, here and here. However, this particular paragraph is written by the people who make sure that the wheels stay on the Internet's bus. This is really a very important issue and it's time the router vendors solve this problem. 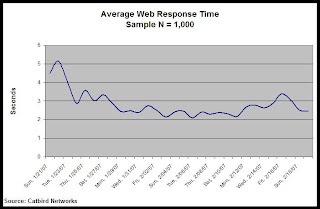 After the attack I reviewed our aggregate DNS and web performance data. Catbird gathers over one million data samples each day so I had more than enough to choose from. I chose a random samples of our monitors and developed the two charts included in this post. The Feb 6 attack occurs around the midpoint of each chart. 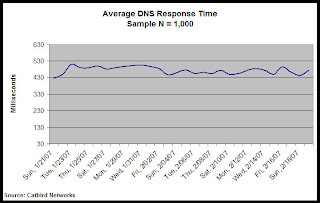 The attack hit two of the thirteen root servers very hard, but as you can see from these graphs the downstream DNS providers and the web sites they serve were not affected. I make this point because I do not believe the attackers intended to bring down the Internet. I think that this was the performance test of an attack botnet. This attack combines good advertising with a live product demo. I will not be surprised to hear about a rise in DDOS attacks and extortion demands made against high-value commerce web sites. I recommend that we all brush up on our understanding of anycast, GeoDNS and related defenses against DDOS.